…You long to tap into a deeper source in yourself, feel more comfortable in your own skin and create a life that inspires you. …You’re a coach, therapist, transformational leader — or are on your way to BECOMING one — and want to make a MUCH bigger difference for your clients. 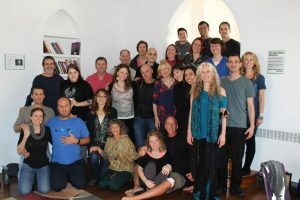 …You’re ready for the next big leap into profound personal growth and your development as an adult with a community of powerful and inspiring people from all over the world. 1. To unleash your unique potential and be a cauldron for your personal growth and transformation. 2. To teach you the art and skills of authentic relating so you can have more rewarding and intimate relationships with everyone in your life. 3. To provide powerful training in the art of circling and give you the skills to masterfully facilitate transformation for other people. 4. To offer Practitioner Certification in Circling for graduates who qualify. Experience the radical personal growth that is available through circling. Read more about circling here. Gain deeper access to authentic self-expression – learn to powerfully and vulnerably express your experience of being with others as it arises. Create more rewarding and intimate relationships and interactions with everyone in your life. Become skilled in the art of circling – This program will train you to become incredibly proficient at guiding people to very deep places. Learn the 7 stages and skill-sets needed to facilitate transformation, including the art of getting someone’s world… in a way that has them feel seen, known and understood, possibly more deeply than they’ve ever been before. Deepen your existing coaching/therapy practice – In addition to your circling training, we also teach you specifically how to translate your circling skills into working with clients, friends, family or work associates who are seeking a change in their lives. 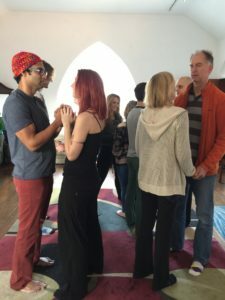 Eight (8) Weekends of Immersive Training – Two pre-requisite Weekends offered on multiple dates & Six core Modules from March through December of 2019. Virtual Circling Practice – Regular opportunities to practice with the Course Leader(s) and Staff as they coach you and give detailed feedback on your Circling skills. Office Hours – For Q&A or mini Circling/Coaching with the Course Leaders. Weekly Peer Group Circling – Practice with fellow students to deepen your skills and receive support. Private Facebook group – Stay in contact with your peers and instructors as you are learning and sharing. Homework & Training Materials – To deepen your knowledge and skill levels, each step of the way. To get Certified as an Art of Circling Practitioner, complete the two pre-requisite Weekends and all six Modules and pass the Certification in your last Weekend Module or through a virtual follow-up session. Pre-requisites (Sovereign & Explorer Weekends) are intro Weekends open to the general public. These Weekends cover the basics of circling and authentic relating and will give you skills and experience to practice the principles in your life. We recommend (though not required) that you start with the optional Immersion Weekend first if you’ve never had any prior experience of Circling. Sovereign and Explorer Weekends are required to be eligible for the practitioner training. Art of Circling Modules 1 – 6 will take you through all the steps to become a skilled practitioner of Circling and are only open to those who meet our qualification requirements. We also welcome returning graduates to take any of these weekend modules to refresh or update your abilities. Live Training Weekend Modules will be held in the San Francisco Bay Area (location to be confirmed soon). If you have more questions and want to explore if the course is a fit for you, contact us to set up a conversation. You can Email us at info[at]circlinginstitute[dot]com and we will follow up to discuss the program and what it can do for you. Can I register for the whole course right away? Yes, you can go ahead and register and pay for the whole course without pre-approval. If you have prior experience of Circling, we certainly encourage you to do so. We will follow up with you shortly to schedule an orientation conversation to get to know you, set clear expectations on the training and ensure it is the right fit for you at this stage in your life. If we confirm you are ready, we will send you the follow-up logistics info. If it turns out for some reason that it is not the right fit for you at this stage, we will issue you a full refund right away. We do this to ensure you are ready and willing to go through the deep transformation and learning that this journey entails. Circling, co aching & therapy are three different modalities with different intentions and goals. You can read more about the difference between coaching, therapy & circling here. However, circling skills can profoundly enrich coaching, therapy and leadership facilitation. In this training, we distinguish how circling can be offered inside of a coaching framework so that it can be used in a professional context in service to a client’s goals and desires. You’ll learn the basic coaching skills necessary to create a powerful relationship with clients at the outset and help them integrate and implement changes in their lives after circling. However, the primary focus of the course will be learning the circling skills that can elicit profound transformation and the emergence of more authentic levels of being, both in yourself and others. How much of a time investment is this? Will I have time with my busy schedule? We designed the program to provide the immersion and engagement needed for rapid learning and personal growth, while at the same time spacing it out so that it can easily integrate into the lives of busy people. The program runs monthly or bi-monthly and we’ll meet in person each time for 2-day or 2.5-day long weekend trainings. Most people find that this schedule makes it easy to participate in the training, integrate what they are learning and balancing the needs of personal/family life and work. What if I have to miss a live training weekend? No problem. You can continue the course with the subsequent weekend modules and catch up on the missing weekend(s) anytime within a 2 year period. This is an in-depth training for people who want to accelerate their personal growth and become extremely skillful at facilitating transformation for others. Because of this, a good number of the participants in the program are coaches, therapists or experienced circlers. However, there are no formal prerequisites for this training and we welcome people with a variety of experiences. We also offer additional assistance and coaching to individuals as needed to allow each person to thrive and get the most out of their training. That said, because this is an intensive training, it is not for everyone, and we will personally confirm with each person upon registration to ensure it is a good fit at this stage in your life. What does “Art of Circling Certification” mean & how does it work? We will be offering Practitioner Level Certification and official endorsement from The Circling Institute to qualified graduates of the Art of Circling Training. This means that if you meet the criteria we will certify you as a Practitioner in Circling for individuals and groups at a basic level of proficiency and you will be listed in our registry of Certified Circling Practitioners. Some participants in this program won’t have the desire to attain Certification, if so you will still be recognized as a Graduate of the Art of Circling. For those of you who want Certification, we will be evaluating you on a series of skill-sets that we will make clear during the course. Because everyone is beginning the course with different skill-sets and levels of experience, gaining Certification is not guaranteed and it is expected that some people will not pass the first time. If you don’t pass the Certification evaluation on the first attempt, you will have other opportunities to do so after the completion of the training, which we can discuss. If you really want to get your Art of Circling Certification… we want to help you get there! I am a returning student, can I retake individual Weekend Modules and how much do they cost? This program is a journey of the soul. Talk to us, and you’ll know if it’s right for you. Email us at info[at]circlinginstitute[dot]com if you would like to discuss the program and what it can do for you. If you’re ready to give your greatest gifts and make a profound difference in the lives of your clients, co-workers and loved ones, then join us for a training that will change the course of your life.